Not sure if you all have been keeping track of the repository, but L'In20Cible and I worked through the issues we had with getting damage to work, and it now works properly (with the exception of the hitgroup offset). All entities, not just players, can damage any other entity, so we added it to the BaseEntity class instead of just the PlayerEntity class. Again, the hitgroup offset is wrong, and I still need to look that up again. If you have any other questions on this please feel free to ask away. I should probably add a bit more information on some of the things that script does internally. Notice that hAttacker, hInflictor, hWeapon, and bitsDamageType are not listed as those are already set using the arguments. Make sure you are passing the proper type of value when using keywords, otherwise you will encounter errors. The damage amount that you pass will not necessarily be the actual damage done to the player's health. I will probably be looking into the algorithms that Valve uses to backtrack them to set the proper amount of damage to be done, at some point. satoon101 wrote: The damage amount that you pass will not necessarily be the actual damage done to the player's health. I will probably be looking into the algorithms that Valve uses to backtrack them to set the proper amount of damage to be done, at some point. Looking at the parameters I'd guess it depends on the damage type. i.e. any bullet-style stuff will also take player armor into consideration as well as hitgroups I suppose, while stuff like falldamage probably will rely more on the vectors. Yeah, the damage might get a bit too complicated based on a number of things. So, I am not sure how feasible it will be to get the proper damage, unfortunately, but we will look into it. 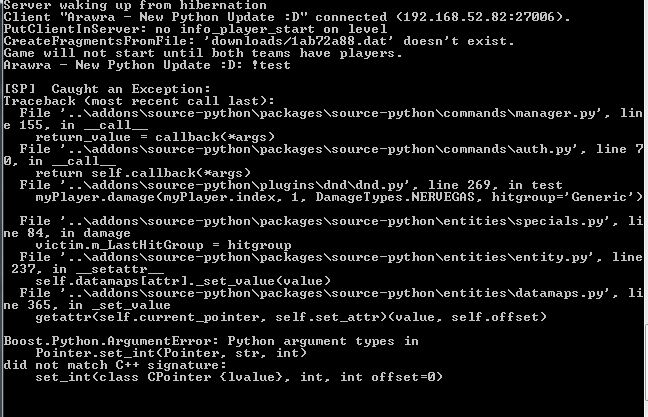 Also, the hitgroup for Windows servers is correct, now, but I have yet to test on Linux. I am having all sorts of connection issues with my Linux server, but the hitgroup offset seems to be correctly on it, as well. Again, wondering if this is my issue or if there hasn't been an update to the methods and properties. That one was my fault. The newest update should fix that issue. Just a simple type error typo, I hope? So, in setting the m_LastHitGroup value, you are attempting to set it to a string when it should be an integer value. For "generic" damage, use 0. Is the damage still working? Achievements disabled: cheats turned on in this app session. If I were you I would take a look at the available functions in PlayerEntity. "take_damage" is a function that is callable and should be supplied a "CTakeDamageInfo" instance. It relies that you have the correct signatures/offsets though. So this method may break at some point, but is definitely the most stable method. BaseEntity already has a built-in wrapper for that. I haven't tested calling it in a while, but there are planned changes for it that should happen soon. Also, don't use 'type' as a variable name as it is a built-in function in Python. And, all damage types are already stored in entities.constants as damage_types (DamageTypes in master branch will eventually be changed).